TEA BENEFIT The healthful properties of green tea are largely attributed to polyphenols, chemicals with potent antioxidant properties. 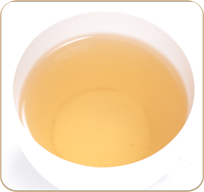 In fact, the antioxidant effects of polyphenols appear to be greater than vitamin C. The polyphenols in green tea also give it a somewhat bitter flavor. Green tea can help prevent arthritis: A recent study found that antioxidants in green tea may prevent or reduce the severity of symptoms of rheumatoid arthritis. Antioxidants in the tea inhibit the Cox-2 gene that triggers inflammation, working in much the same way as anti-inflammatory drugs. DESCRIPTION Tiny, tightly rolled leaves gently unfold when infused. Classic green tea flavor, lightly astringent. A full bodied tea with unique flavor. Take one heaped teaspoon per 200 ml of freshly boiled water. Use a tea pot or a carafe. Let water cool for 30 seconds. Pour water onto the tea. Cover and brew for at least 1 to 2 minutes adjusting brewing time with strength and taste desired. Rinse pot after wards with hot water only. Do not use soap. Please do not add milk or sugar.